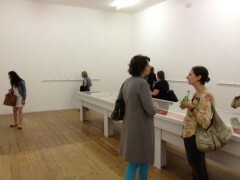 Blog following my residency at the Nunnery Gallery, London. I will be responding to the work of Outsider artist Madge Gill and producing a new series of drawings for the exhibition ‘Autography’, opening 23 August 2012. Well it’s been a busy couple of weeks. 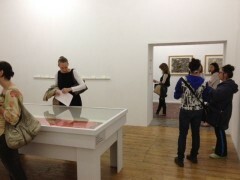 Following the opening of Autography last month I seem to have been zipping around left, right and centre across the UK. This includes giving a talk on my drawings and social media at Matt Roberts Arts as part of their ALAS residency scheme, along with a workshop at AIRTIME in Nottingham. I’ve also been doing a lot of writing and editing for AIR, including my new monthly column for self employed artists called Taking Charge. It’s been great to focus on these other activities after such an extensive period of drawing. I love the fact my career is dynamic and it is definitely beneficial to work on separate projects with different individuals and organisations. I never get it when artists are shy about their portfolio careers. Who can honestly say they work on their practice 24/7? And who would really want to? If I spent 100% of my time on my drawings I would probably a) go insane and b) go blind! I’ve only just started a new series of drawings but I feel the short break of around two weeks has been beneficial. The drawings feel fresh and an evolution of what I was producing prior to the Nunnery Gallery residency. It has been nice to work without the pressure of a deadline, commission or upcoming exhibition. The last nine months have been pretty relentless in that sense. One thing that has been bothering me is whether I should end this blog. Technically it is tied to the residency and exhibition, and I don’t want to deviate too far from it’s original purpose. I’ve basically decided to stop worrying so bloody much! I will just switch to a new blog when the time feels right. There’s still quite a lot of Autography related activity anyway, including my artist talk this coming Wednesday at the gallery. It’s sold out so there should be quite a large group, including several of my collectors. I’m sure they will have some pretty stimulating questions! Check back later in the week for video highlights! The North One TV film I was recently interviewed for is now online. It’s a nice little clip, featuring interviews with myself along with fellow Bow artists Bhajan Hunjan, Fiona Gall and the founder of Bow Marcel Baettig. 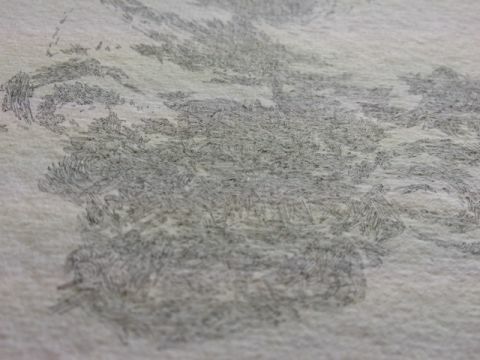 There are some brief shots of me making drawings for the ‘Autography’ exhibition, along with details of my fingerprint works. I explain the importance of Bow to artists with portfolio careers, as well as how sharing a studio with artists Lizzie Cannon and Elizabeth Murton has benefitted my practice. Check it out! Well I wasn’t expecting that…! 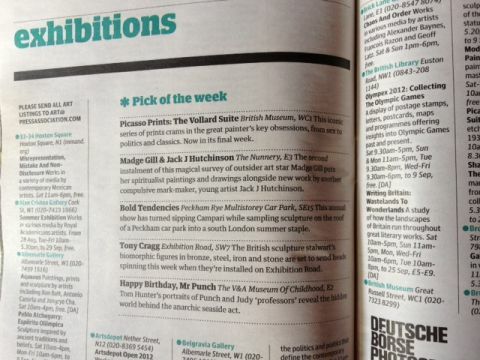 Opened up today’s Guardian to see ‘Autography’ has made their Top 5 exhibitions to see this week. I’m obviously very pleased, not just for myself but for Gill. It would be really interesting to know what she would make of it. How would she feel about making the Guardian’s ‘Pick of the week’? She rarely exhibited during her lifetime. Would the thought of such publicity horrify her? It’s a very strange feeling to collaborate on a project with an artist without ever speaking to them. I guess it’s indicative of the strength of Gill’s work that I feel so close to her. Drawing is a different type of language and it has allowed me to connect with another artist 51 years after her death. I wonder whether someone will be doing a similar thing with my drawings after I am long gone…! I have to admit I was incredibly relieved it was so well received. The last six weeks have probably been the hardest I have ever worked on a show. The 40 drawings I produced in that time were created in quite isolated and intense surroundings, and it was scary seeing them exposed to the public and under close scrutiny. I find private views claustrophobic at the best of times, and I always have my professional hat on (i.e. network like mad and don’t drink too much!) which makes it difficult to truly relax. However, once I’d got over my initial fears I genuinely enjoyed the evening, particularly the number of interesting conversations with people I have great respect for. Historian Gary Haines, who has contributed research for the project, had some insightful things to say. Also, the Outsider art expert Roger Cardinal suggested I try drawing with my eye’s closed. Not sure the mark making would be quite as precise, but it’s worth a go! Today it feels strange that the project is theoretically over. However, the urge to draw never really leaves and I am already thinking ahead to what I am working on next. I also have a show opening in a week in Terrington in North Yorkshire which I need to prepare for, along with lots of AIR and a-n admin to catch up on. Plus the ‘Autography’ talk with Annabel Tilley takes place on 19 September. 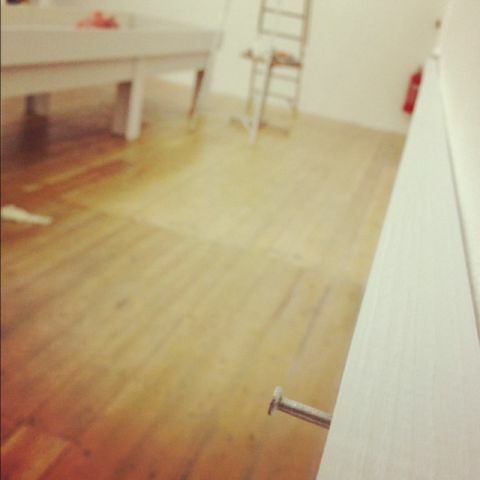 Day three of the installation of ‘Autography’ and everything seems to be going to plan. The first two days were all about cleaning up and preparing the space – you know, all the tedious stuff like putting poly filler in drill holes. I also had a trip to B&Q, which actually excites the same feelings I had as when I was 10 years old and on my way to Toys R Us. To top things off I realised I needed to do three more drawings. Funny how things change once you are actually in a space! There have been moments over the last 48 hours where I have felt physically and mentally drained. I always get like this in the last few days before a show, and I’m sure I am a real pain to be around. All I can say is I have wonderful friends and family who put up with it! Anyway, today comes the fun part. Newham Archives are delivering Madge Gill’s work. There is the large scroll to be installed plus 14 framed drawings to hang. I will also be placing my 40 drawings on shelves around the large central space. The vinyl labels are (hopefully!) arriving tomorrow which is cutting it a bit fine but I’m confident we will be ready for the 6pm opening.